Dan Fishman from our Events Department sits down with Dave Harvey of NYC Barn Dance, the beloved square dance caller who is returning to lead Bryant Park's fourth annual Square Dance. Dan Fishman: You’ve led so many square dances throughout the city – what makes for a great square dance? Dave Harvey: The most important thing is having an enthusiastic crowd. It doesn’t matter what I do or what the band does if the crowd doesn’t bring a lot of energy and excitement to the event. DF: Do you think Bryant Park crowds bring that kind of enthusiasm? DH: [chuckles] Yeah, definitely. And it’s just a fantastic mix of people in a fantastic space. Makes for a unique experience for everyone – myself included. DF: I’m still amazed that New Yorkers have become so enamored of square dancing. Obviously the square dance has its roots as a rural event. What do you think has made it so popular here in the city? DH: Well, it’s rural in origin but there’s nothing about it that should make it unappealing to an urban audience. Maybe one difference: in a small community you’re used to knowing everyone around you and in a city we don’t pay all that much mind to all the people around us. But everyone enjoys interacting with others and events like these remove inhibitions and create a safe environment for people to interact. It’s social dancing with some structure: even if you don’t consider yourself an amazing dancer, you can express yourself within a structure that allows for some comfort. 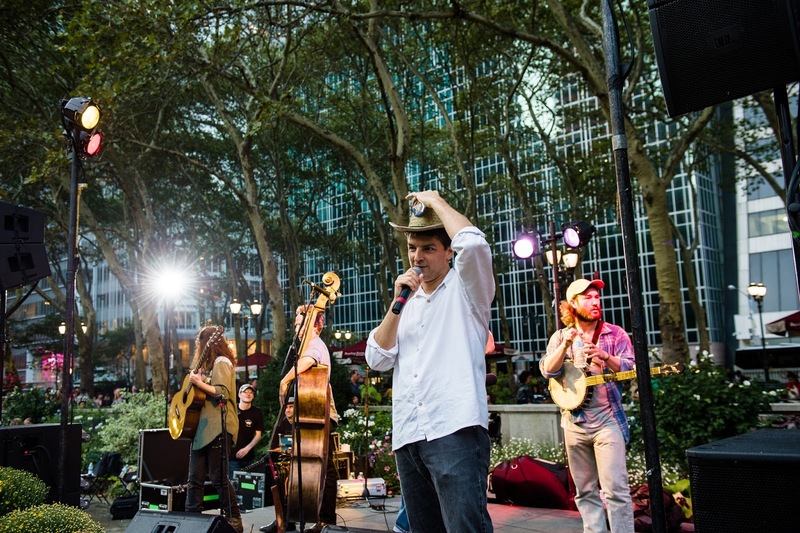 Dave has led at all three of the previous Bryant Park Square Dances. DF: Are there any tricks that you have as a caller to help people feel more comfortable? DH: Keep it easy. Easy and energetic – that’s the key. It’s important to keep things at a level that people can enjoy. DF: Especially at Bryant Park: many of the people who square dance here have never done it before in their life. DH: Yeah! There are folks coming in and out at different times and at very different skill levels. The best way to keep it interesting is to add variety: long-ways dances, big circle dances, squares, 8-person squares, 4-person squares. And as I like to say: it’s not a dance class, it’s a dance party. DF: How do you prepare for calling all of those dances? How much is improvised? DH: I tend to over-prepare and I usually use all of the dances I prepare over the course of a night. That being said there’s improvisation in a sense: the timing and sensing what the crowd on the floor wants. It’s the same with musicians: there are musicians with great technical skill but they are not interesting dance musicians. They’re flawless but it lacks energy. Musicians also have to have a feel for how people move to their music – rather than just play the tune impeccably. Calling square dances is the same thing. DF: Speaking of music what do you think of bands for this weekend: The Remedies and The Calamity Janes? DH: They’re fantastic. Great energy. They know each other well and listen well. Very experienced, talented musicians. I’ve worked with them a lot, in particular The Remedies, and they know my style and the tunes I like. I don’t really have to ask anymore: they know well. DF: You’ve been talking a bit about your experience as a caller. Can you tell me more about how you got started? DH: There wasn’t a single moment. The first dance I went to was at Bates College, where I went to school. I was told it was a good time and it was and I started going a lot. There was a point when I would go to two or three dances a week. Basically I learned how to do it by going to a lot of them and by paying attention. I also am a person who likes to organize and to get a party going – so it seemed like a fun thing to do. At some point I was asked to lead a dance as a volunteer and did that well and eventually did enough of those to get a paying gig. And it just went from there. In New York I organized my own gigs: bought a sound system, brought in bands, advertised – and it’s been nine years now that I’ve been doing that at NYC Barn Dance. DF: One more question: let’s say you’re talking to a New Yorker you’ve never met before and they’ve never heard of Bryant Park Square Dance. What do you say to them to get them to come? DH: It’s awesome music under the lights in the middle of Manhattan with hundreds of people and you don’t have to know anything about it to have a great time. And people at the event are always smiling – that’s what makes it interesting for me.